Floyd Reifer led a weakened West Indies team to defeat in the first Test against Bangladesh, but he chose to see the brighter side of a dispiriting loss, lauding his players for fighting hard under adverse circumstances. "For a team that was brought here right before the Test match, I thought we really fought well," he said. "We represent West Indies and we'll go to Grenada [the venue for the next Test] and fight hard." "It was a rush," Reifer said about the experience coming into this Test. "But we've been training and practicing hard, and it's good to be back here again playing Test cricket." Reifer singled out the performance of the batsmen in the first innings as the factor that tilted the game in Bangladesh's favour. West Indies were bowled out for 307 in their reply to Bangladesh's 238, but only after Dave Bernard and Darren Sammy helped take them into the lead following a middle-order wobble. Each of the first five batsmen, including Reifer, reached double figures, but only one among them went on to score a half-century. "In the first innings, a lot of the guys got starts but never carried on to make big scores," he said. "Omar Phillips made 94, but we should have got a bigger total in the first innings." 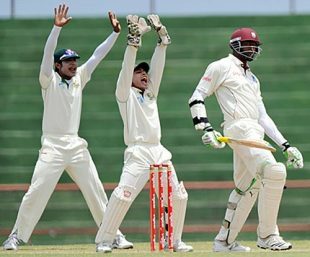 Reifer's Barbados team-mate Kemar Roach, who grabbed six wickets in his debut Test, came in for special praise. Roach finished with 3 for 67 in the second innings with the wickets of Mushfiqur Rahim, and Mahmudullah in the morning on the fifth day. "The first time I saw him [Roach] as an under-19 bowler, I always thought he was going to play for West Indies. He does a lot, especially with the old ball, getting it to move in and out and he performed very well this morning, bowling decent lengths and lines." While mentioning that West Indies could opt for an extra batsman for the next Test to counter the Bangladesh spinners, Reifer added he would want a more competitive surface for his fast bowlers - his team's main strength. "We would want some more grass on the wicket, and some bounce," he said.